All OJO Images 37 CDROMs! Choose & Download Your Missing Serie! The Germany-based company Sachform, founded by 3D freelancer Jan Häusle, created an impressive series of high quailty spherical panorama photos, covering the complete viewing angles from 0 to 360 degrees in all directions. The seamlessly looping environment photos were taken at several different light exposures in order to prepare them for being combined into a high-resolution HDRI bitmap of 3000 x 1500 pixels. 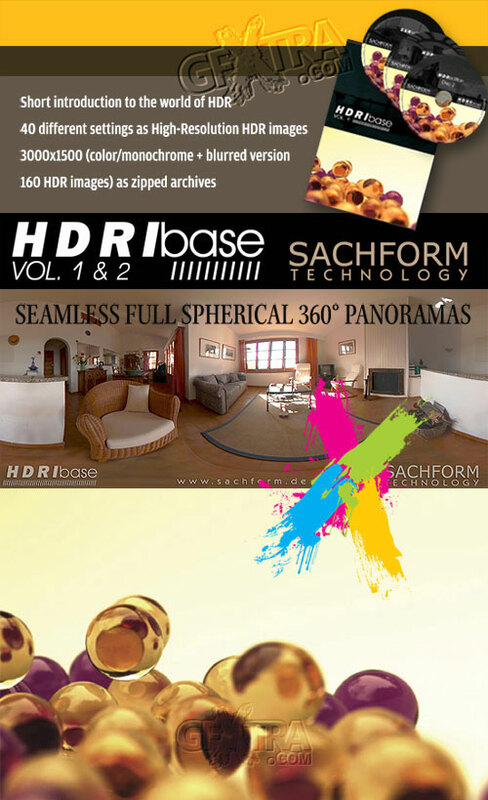 The resulting two image collections by the name of HDRIbase are for sale independently or bundled at www.sachform.de. Each collection offers 40 different environments. Presenting LiveSurface Shift Image PSD Library: finished photographic images from your flat artwork in seconds. Includes Outdoor Series Starter Set and Object, Series Starter Set and Visualize. As you develop design concepts, cut and paste your flat Illustrator or Photoshop artwork into a LiveSurface layered image to quickly visualize and evaluate the concept on real surfaces without having to build comps. Present. Save LiveSurface images as Photoshop files with transparency and then place them into an Illustrator, InDesign, or Quark document for use in a PDF design presentation. Or, take advantage of their high-resolution to print them for presentation boards. Publish. Build final high-resolution images and save them out for use in advertising, print, or online publication (some images restricted): book cover shots for an online store, packaging photos for a software catalog, or CD album cover and disc images for the press. All un-compressed so you can sample whats included or pick and choose, your choice.